Ireland is facing the prospect of Easter snow, with temperatures set to plunge again at the end of next week. Forecasters in the UK are predicting a return of the Siberian chill dubbed the 'Beast from the East', even as we reach the end of March. While it's unlikely the Easter Bunny will need skis to get around, Met Éireann forecaster John Eagleton said that the long-range forecast shows winds turning easterly on Holy Thursday, with temperatures dropping back to low single digits. "It's not impossible," he said of snow falling over Easter. "But it's a long shot." 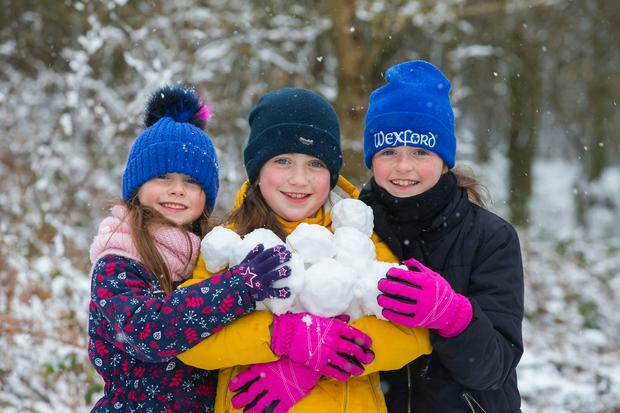 Forecasters across the Irish Sea at the UK Met Office, however, predict more wintry showers following a switch to more seasonal temperatures next week. Meteorologist Martin Bowles said that he doesn't think we will see a return to the same conditions that spawned the so-called 'Beast of the East' over a fortnight ago, or the 'Son of the Beast' conditions that left large swathes of the country under a blanket of snow last weekend. "It's quite a different set-up than with the other beasts," Mr Bowles told the Irish Independent. The last two storms that triggered blizzard conditions and heavy snowfalls were the result of a high pressure system drawing cold air over Ireland and Britain from Siberia, he said. The current computer models show a low pressure system will build over the North Sea. "We expect temperatures to be a few degrees below normal for this time of year," he said. "It does look like there is the potential of wintry showers over high ground. "But I'm ruling out the idea of widespread snow," he added. Meanwhile, temperatures will be mild for a few days as rain sweeps in from the west this morning. The rain will become widespread by tonight, with moderate daytime temperatures of between 9C or 10C, with gusty southerly winds. It will remain cold overnight, with temperatures dipping down to between 2C and 6C. However, conditions will improve tomorrow, with sunny spells and mild daytime temperatures of between 7C and 10C.